Yesterday, I prepared Vegetable Pulao and raita. The vegetables I use for the regular pulao are carrots, beans, peas and potatoes. I rarely use cauliflower and capsicum for pulao. 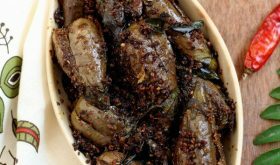 I use whole spices instead of masala powder which yields an aromatic mild flavor to the rice and a combination of ghee and oil for frying the vegetables which brings out their flavor beautifully. Its difficult giving exact proportions of ingredients and spices while writing a recipe since most of my cooking is done by ‘andaz’. Sometimes, I just follow my mood and the available ingredients/spices while preparing a dish like today’s recipe. I try my best to be close to the required amount of spices used in a particular dish while writing the recipe. 1 Heat ghee and oil in a vessel, add bay leaves, cinnamon, cloves, caradamom and star anise and stir for a few seconds. Add the sliced onions, ginger-garlic-green chillis paste. Saute the onions till they turn transparent. 2 Add the coriander and mint leaves and saute for 2-3 mts. Add the chopped mixed vegetables and cook on medium for 4-5 mts. 3 Add a chopped tomato and stir fry for a minute. Add the drained rice and saute for 2 mts. 4 Add the coconut milk and water. Bring to a boil. 5 Add salt and nutmeg pwd and reduce heat to low-medium and cook covered with lid. 6 Once the rice and vegetables are cooked, turn off heat. Add fried cashew nuts and garnish with fresh coriander leaves. 7 Serve warm with raita. à°¹à°¾.à°¹à°¾. à°¹à°¾.. à°¨à°¾à°•à± à°•à±‚à°¡à°¾ à°…à°²à°¾ à°šà±‚à°¸à±à°•à±à°‚à°Ÿà±‚ à°®à°¸à°¾à°²à°¾à°²à± à°—à°Ÿà±à°°à°¾ à°µà±‡à°¯à°¡à°‚ à°…à°²à°µà°¾à°Ÿà±.à°¸à°°à°¿à°¯à±ˆà°¨ à°•à±Šà°²à°¤à°²à± à°‡à°µà±à°µà°¾à°²à°‚à°Ÿà±‡ à°ªà±†à°¦à±à°¦ à°šà°¿à°•à±à°•à±, à°•à±‚à°°à±à°šà±à°¨à°¿ à°¨à±‡à°¨à± à°Žà°‚à°¤à±†à°‚à°¤ à°µà±‡à°¸à°¾à°¨à± à°…à°¨à°¿ à°†à°²à±‹à°šà°¿à°¸à±à°¤à°¾à°¨à±. :) à°®à±€ à°µà°‚à°Ÿà°•à°‚ à°šà±‚à°¸à±à°¤à±‚à°¨à±‡ à°…à°•à°²à°¿ à°®à±Šà°¦à°²à±ˆà°‚à°¦à°¿ à°¶à±ˆà°²à°œà°—à°¾à°°à±. I tried this recipe, came out well. 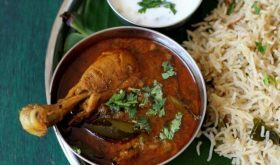 Your Andhra Recipes are really good. Thanks for another wonderful recipe with tempting pictures!! WOW…again..! Simple, comforting, nutritious, quick and tasty, thats Veg Pulav, I rely on this for those days when I am pressed for time..A complete one pot meal..Great presentation again! 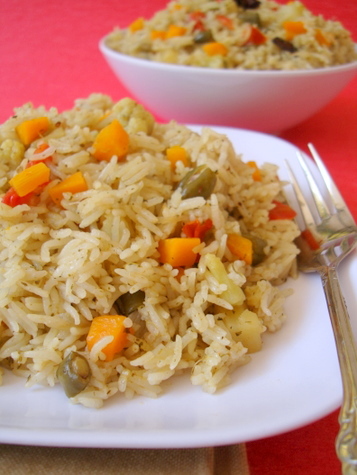 pulao looks v.tempting…is coconut milk essential for this particular dish?? ?..being a north indian we rarely use coconut. You can substitute with yogurt/curd. How do we use curd… will it not break out when you boil it? 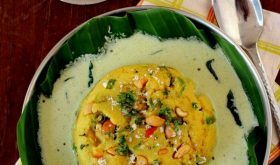 do we need to add besan or anything to the curd, before adding to the recipe? I visit your website on almost once a week. I really like the way you present the food. As some readers pointed out that some of your photos are being used in few dailies I would recommend you to use water mark on your photos with your website name so that they cannot copy them. Its just a suggestion from my end. Your presentation of food is second to none. Keep it up..
sailu garu pls mention some of the names in telugu also like cardamum, cinnamom, bay leaves alantivi pls andi. Cardamom – Elakkaya, Cinnamon – Dalchini chekka, Bay leaves – Biryani akku. ABHA MAKU CHUSTUNTAYNAY NORRU URRU THUNDHI. EMM VANTALU BABOI. ME VANTALU CHUTANIKI BAGUNAI SAILAGA AKKA. I like your recipes and your site. I am following your blog from 3+ years. I have tried many of your recipes. I first started with fish curry and today I made paneer masala. They come out nice. I always wanted to post a comment but didnt. I also like the different varieties of dishes you cook. I have tired a few recipes of yours which were really good tasty and perfect. But all your recipes have cup measurement. I would like to know whether it is 200ml measurement or tea cup. kindly let me know which cup? Its American cup measurement, 240 ml. tried it today, came out very well. super yum. 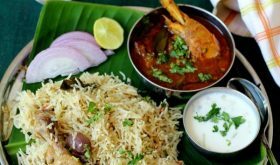 a must try veggie pulao.. The receipe came very well. It was so good…. Thanks for the recipe. 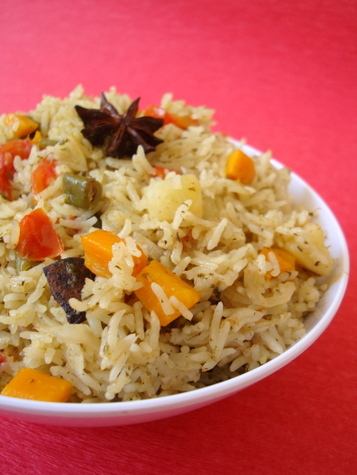 I made this vegetable pulao, it came out very well. The recipe was very simple to follow. 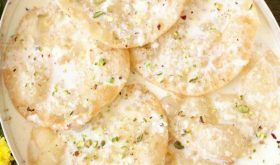 I tried this recipe Yesterday……Lovely…thanks…..I tried with curd ….. Tried it today, came out very well thanks for this recipe…..
just wanted to know, can we just omit nutmeg powder?